Are you addicted to your Clarisonic? I know I am. After removing my makeup with an oil-based cleanser, I use a gentle cleanser with my Clarisonic to remove all remaining traces of makeup and oil. Wow. Such clean. Many refresh. For many of us out there, however, our skin can get sensitive and those little, vibrating bristles can feel less than revitalizing. Whether you naturally have sensitive skin or have sensitized skin due to rosacea, eczema, or other type of skin condition, you might think the Clarisonic is not for you. Well, there’s good news, people! Perhaps you’ve been to a store recently and seen those Clarisonic Cashmere brush heads. I’ll have to admit, their marketing isn’t terribly clear. Yes, they look luxe and fluffy and cost $5 more than any of the traditional brush heads Clarisonic sells. I was confused for the longest time as to why I should pay more for something that probably works just about the same. WHY? I DON’T UNDERSTAND! Have no fear (cause I’m sure you were panicking, right?). Here’s why you might want to investment in this fancy schmancy brush. 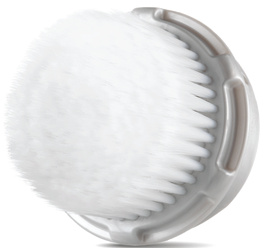 The Clarisonic Cashmere Cleanse Facial Brush Head is phenomenal for those with super sensitive skin. It doesn’t irritate, inflame, or cause discomfort. It’s my suspicion that because the brush head has both longer bristles and more of them, it puts less pressure per square inch on your face. This densely-packed brush is able to clean just as well as the slew of brush heads Clarisonic already sells, but it just does it in a more coddling way. So, before you toss that brush head and pack up your Clarisonic for good, try the Cashmere brush head. Note: If you already bought a brush head that’s causing irritation, bring it back to your retailer. Stores like Sephora and Nordstrom have phenomenal return policies that allow to return merchandise even if it’s used, and you don’t have a receipt! They want you to be happy, and sometimes there’s not way to know if something will irritate your skin until you bring it home and use it for a while.